Following a topsy-turvy first set and second that found the two-time Wimbledon champion down 5-1, Petra Kvitova managed to defeat Maria Sharapova, 6-3, 7-6 (3), at the Singapore Indoor Stadium to advance to the WTA Finals championship match against Agnieszka Radwanska. Her press conference transcript, provided below in full, is courtesy of FastScripts by ASAP Sports. What were you thinking when you were down 5‑1, and then what happened to help you reel off five games in a row and totally change the course of the match? 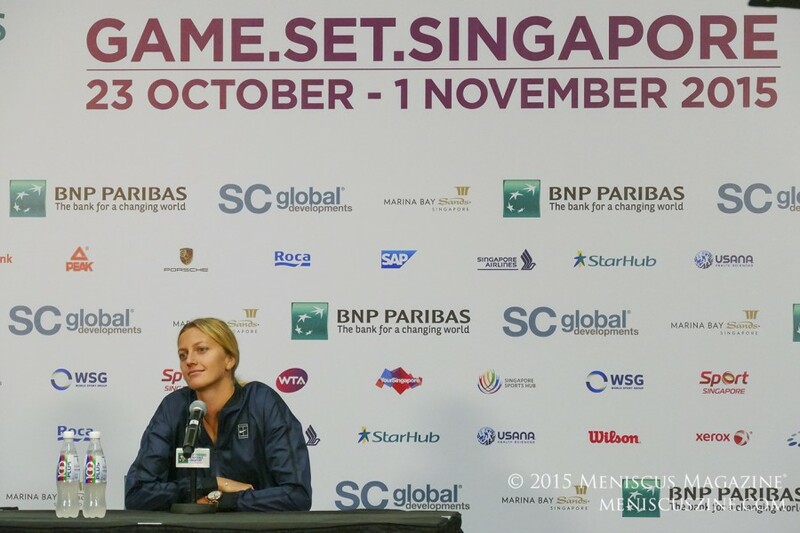 PETRA KVITOVA: For sure I didn’t think the set is over. For sure not. I was on the serve and it was still ‑‑ you know, I break her before, does so I was still believing that I can do that again. I was just focusing on every point what I played, and I think I was just ‑‑ Maria really came back strong in the second set and really played well. I was just there and waiting for my chance or doing what I could in this moment. I was really fighting for every point and returning, and I did good serving as well in the few games over there. So that’s help me a lot. Strange 24 hours. Last time we spoke to you were waiting for Lucie’s result to come in. Now the semis and now the final. PETRA KVITOVA: It’s very weird, I have to say. Yesterday I was talking about my season, and it’s still not over yet. But I’m happy for that for sure. I mean, I couldn’t really believe that I going to play semifinal; now I’m the final, which is very interesting. I’m really looking forward. I think Aga is kind of in the same situation, so it’s going to be interesting. Did you feel any differently on the court today? You seemed a lot sharper and maybe more upbeat than the past few matches? Did you feel better? PETRA KVITOVA: I just think every match what I’m playing here is better and better. That’s a good sign. I knew that and I felt okay today. I think that even yesterday fight was great and gave me a lot of good things. Unfortunately I didn’t win, but doesn’t matter right now. It’s been good, and I knew I have to serve well as well. I know how Maria is returning, so the serve was there as well so that’s good. I don’t know whether you’re aware, but Chris Evert sat where you’re sitting a few days ago and she was talking about the current game. She said that the players like Maria and Serena have a hunger for the game. She wasn’t sure whether you all the time have that hunger. I guess today’s result was an answer to that, wasn’t it? PETRA KVITOVA: It wasn’t. I don’t think so. I think I’m hungry every time. I just sometimes don’t show it. So doesn’t matter that I don’t show it and be visible, it’s in the there. It’s always there. Sometimes it’s somewhere in myself, which it’s sometimes difficult to put it out. It’s just my personality. Sometimes I try to fake these emotions, but it’s not me so it just didn’t help. You played Maria before; been very difficult over the years. This time you played very well. Did you do something different? PETRA KVITOVA: Tough to say. I think I didn’t really. I mean, I was just trying to do the same what she’s doing, the same what I did yesterday. You know, going for it, be really aggressive, and just playing kind of flat shots if I can say, and kind of deep in the court and trying to push her. Just a little bit more about the format. I think that they’ve never had a player who was 1‑2 actually win this title, and now they will. Do you think that’s kind of fun for fans, or different? Any thoughts on that? PETRA KVITOVA: The thoughts? I think it’s great that it will happen. It’s something new in the history, so that’s good for you guys, that you can write about it. I don’t know. I mean, that’s the sport. That’s the format how we play in the groups and everything. It’s very interesting. I really don’t know what I should say about, but it’s just the tennis. I think that Aga is kind of on the same level as me, that she’s improving each match, so that’s a little bit different as normal tournament. Just talk about playing Aga tomorrow. You’ve met quite a few times, and half have come at this event. So just your thoughts going into that match. PETRA KVITOVA: It’s difficult opponent, for sure. She’s very smart. I think she has a lot the variety on the court. She getting so many balls, so sometimes it feels that she’s never‑ending story on the court. So it’s really about the patient and still be kind of sharp, but playing a lot of shots and rallies. It’s difficult. But last match of the season for her, for me ‑ even if I’m not counting with the Fed Cup ‑‑ so both of us will leave everything out there tomorrow. Do you think that you’re the type of player that when you see the finish line, when you’re closer to it, that you play better than maybe when the finish line is very far away? I wish that. So I don’t really like the beginning of the tournaments for sure, but that’s how it is. I mean, as I said, it’s probably normal that I’m improving kind of my game each match. That’s happening here as well. Finally I see the final line, so that’s good. Is there any sense of, Okay, tomorrow is it. I know Fed Cup, but tomorrow, that’s my season? I don’t know, are you more relaxed? Positive? What are you think mentally? PETRA KVITOVA: I am positive anyway, so I don’t really think that will change anything like big. But for sure it’s going to be last match here, and I will do everything tomorrow to win that battle. When you saw Lucie win, did you say, Now I’m really happy; I can come back on the courts now? PETRA KVITOVA: You know what? I wasn’t really interesting to watching the match. I did watch a little bit because it was just TV in the room, but I just didn’t have kind of the emotions. I was just, Okay, let’s see how everything happens, and that’s happen, so it’s kind of ‑‑ Lucie played so well yesterday for sure. Her forehand down the line was incredible, so I hope she going to save some for Fed Cup as well. You put out a tweet that you’re going to get her beer. PETRA KVITOVA: No. We are Czech Republic, so it’s kind of beers. You should try. The occasion tonight probably was the biggest crowd you played in front of this week. Maria is probably the biggest opponent. Biggest match being a semi. With you winning it in straight sets, what do you think it says about you as a big match player that raises their game at the most important moment? PETRA KVITOVA: I’m thinking in the good way for sure. I didn’t come to the court as, Okay, I’m playing Maria. Oh, boy. It’s terrible. It wasn’t like that. I mean, it was a match. I know Maria played so well in the group and still have a confidence and everything, but I wasn’t really thinking like that. I mean, from yesterday I didn’t really have something to lose. Probably that’s why I was so relax and something happened out there today. I was really playing good game, so that’s it. You won this title in 2011 I guess, your debut. How is that different? Will that give you any kind of advantage, do you think, tomorrow? PETRA KVITOVA: It’s different because I lost two matches in the group. It’s just still feels so weird that I’m in the final. You lost and still ‑‑ it’s terrible. And 2011 I didn’t lose the match so it felt as exact tournament. This is a little bit special. Tough to say if I have advantage. It’s just like a final. I don’t think it’s any like difference playing final here or Grand Slam or something like that. Aga did it as well, so I think both of us are kind of experienced from this one. You posted a picture on Twitter before the tournament with the T‑shirts, the Nike T‑shirts. Can you offer a decoding? Can you decode all of those words? What does it mean? PETRA KVITOVA: I think I can, yeah. Was a pepper down the line. That’s the forehand. Cucumber what? I can’t remember. Pepper on the serve, cucumber down the line, and banana better. Banana better I think I can’t really recognize if it’s better. But it’s good.